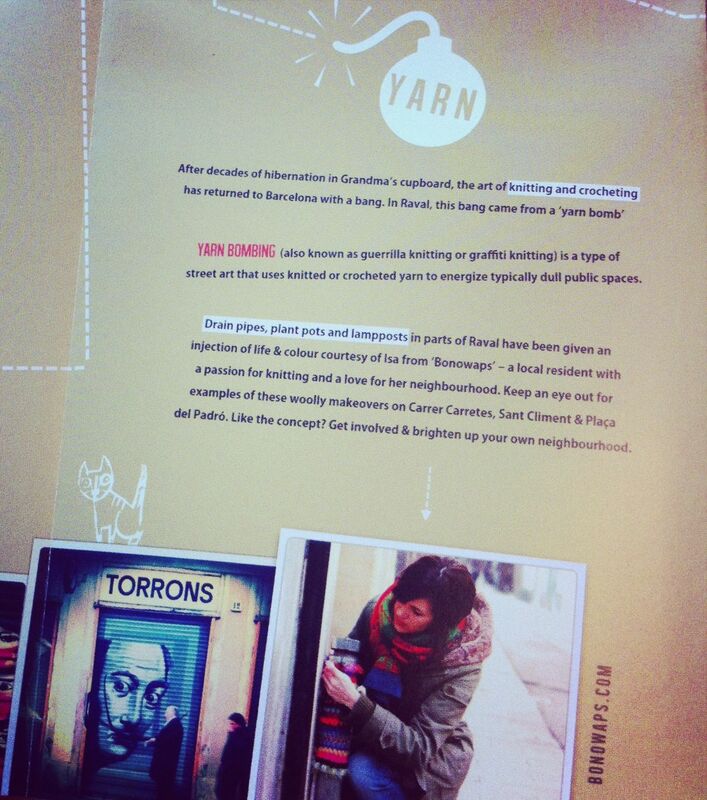 El proyecto de embellecimento del barrio del Raval en Barcelona – Bonowaps Yarnbombing 🙂 – ha llamado la atención de los chicos de Porktie Magazine y han decidido incluirlo en el mapa del Raval, dentro de su colección de mapas de Barcelona. After decades of hibernation in Grandma’s cupboard, the art of knitting and crocheting has returned to Barcelona with a bang. In Raval, this bang came from a ‘yarn bomb’. Yarn bombing (also known as guerrilla knitting or graffiti knitting) is a type of street art that uses knitted or crocheted yarn to energize typically dull public spaces. Drain pipes, plant pots and lampposts in parts of Raval have been given an injection of life & colour courtesy of Isa from ‘Bonowaps’ – a local resident with a passion for knitting and a love for her neighbourhood. Keep an eye out for examples of these woolly makeovers on Carrer Carretes, Sant Climent & Plaça del Padró. Like the concept? Get involved & brighten up your own neighbourhood.